Right in the heart of Warsaw, surrounded by luxurious hotels and the most prestigious office buildings, we have created an amazing and original place for Your special meetings. Professional service and qualified Indian chefs trained in the best Mumbai restaurants are not the only reason to visit our restaurant. We can guarantee that your experience in our spacious and cosy restaurant will be unforgettable. We have gained experience over the years and many of the guests appreciate our commitment to providing high quality, delicious Indian meals. Paneer cheese baked in tandoor oven, lamb with aubergine and lentils or prawns in Head Chef’s signature sauce are only some of the dishes worth visiting us for. 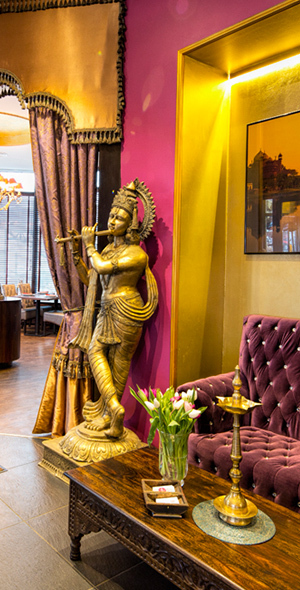 We promote the best Indian food and encourage our guests to get to know the varied flavours of India. You will find a big variety of alcoholic drinks in our menu, including Indian beer and rum, and also alcohol free home-made lemonades. Indian Restaurant ‘Bombaj Masala’ is a perfect place for a business meeting, family lunch or a romantic dinner. We are able to accommodate bigger parties, cater for families with children and also create a special atmosphere for all those quiet celebrations. Thanks to You we are recognised in Warsaw as one of the best Indian restaurants and will strive to always exceed your expectations.